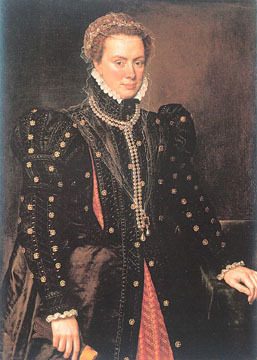 Margaret of Parma, also called Margaret of Austria, Duchess of Parma and regent of the Netherlands from 1559 to 1567, was a natural daughter of Charles V. Her mother, Margaret van Ghent, was a Fleming. She was brought up by her aunts Margaret of Austria and Maria of Hungary, who were successively regents of the Netherlands from 1507 to 1530 and from 1530 to 1555. In 1533 she was married to Alexander de Medici, Duke of Florence, who was assassinated in 1537, after which she became the wife of Ottavio Farnese, Duke of Parma, in 1542. The union proved an unhappy one. Like her aunts, who had trained her, she was a woman of masculine abilities, and Philip II, when he left the Netherlands in 1559 for Spain, acted wisely in appointing her regent. In ordinary times she would probably have proved as successful a ruler as her two predecessors in that post, but her task was very different from theirs. She had to face the rising storm of discontent against the Inquisition and Spanish despotism, and Philip left her but nominal authority. He was determined to pursue his own arbitrary course, and the issue was the revolt of the Netherlands. In 1567 Margaret resigned her post into the hands of the Duke of Alva and retired to Italy. She had the satisfaction of seeing her son Alexander Farnese appointed to the office she had laid down, and to watch his successful career as governor-general of the Netherlands. She died at Ortona in 1586.